This page almost didn't happen, folks! I was so damn tired, I fell asleep at my desk at least once. Late, late last night... I woke up randomly. It took me a minute to realize there was a bit too much... moisture on my hand. Probably what woke me up? I leaned up to investigate. I turned on my light, and saw Peanut sitting there. I realized there was even more moisture on my pillow, part of my sheets, and even my friggin phone. I was sleepy and confused, but then it clicked. Yeesh, I'm sorry to hear that. I can't blame Reagan; people will always be people, no matter when or where, they will always tend to judge appearances. Haha, it happens... Well, no. It hasn't happened before. But it has now. I guess this is my life now. This is now a thing that happens. So, is Tet not cognizant that the End happened? Show us what's under the mask!! Oh, man... And cat pee REEKS! >_O Usually not a good thing if a cat is doing that either. He's been kept in the dark on what happened to the nice sights. Wonder if the gang will spill the beans to him? Everyones picturing him with a missing jaw and such, it seems, bwahaha... Nothing so extreme! Yeah... I mean, if you like deserts, it might be cool. 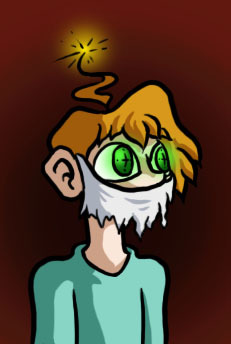 The mask is hiding a poisonous gas weapon located in his mouth in case it is needed, haha.